Former Senator George J. Mitchell will speak at the 2003 commencement this June. 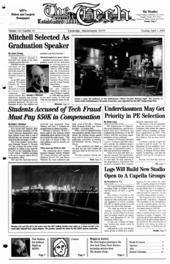 Four former MIT students, three of them former members of The Tech’s business department, have been ordered to pay back a total of $48,284 they are accused of embezzling from this newspaper in 2001. The Department of Athletics, Physical Education, and Recreation may give freshmen and sophomores preference in the PE lottery with the upcoming implementation of new software. The Logarhythms are building a recording studio in Walker Memorial for use by all MIT a capella groups. MIT’s response to the wrongful death lawsuit filed by the parents of Richard A. Guy Jr. ’99 has been delayed a third time by the agreement of the parties to the case.